Today is the 232nd episode of Omkaram Yogakshemam Program of Zee Telugu.To attract Sthira Lakshmi the Omkaram Yogam Kshemam puja as described by Omkaram Devi Sri Guruji in Zee Telugu. 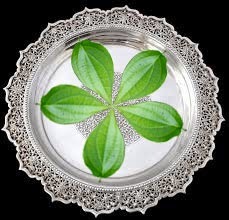 Today evening (19-2-2015) keep 5 betel leaves in a plate facing 5 sides. Put a Maha Lakshmi statue between them. Worship it and chant Kanakadhara Stotram. Offer harathi and Jaggery mixed with soaked rice to Mahalakshmi as Prasadam. Mix it with honey and share it (Prasadam) with children. By doing this one can attract Sthira Lakshmi. This is the puja suggested by Omkaram Devi Sri Guruji in Yogam Kshemam Part telecasted on date 19th February, 2015. మహాలక్ష్మి అనుగ్రహం కోసం ఈ రోజు 1 ప్లేటులో(స్టీల్ కాకుండా) 5 దిక్కులులో తమలపాకులు పెట్టి, తమలపాకుల అమరిక ఎలా ఉండాలి అంటే తొడిమలు వెనుకగా 5 కొనలు మధ్య కలిసే చోట, అంటే ప్లేట్ మద్యలో లక్ష్మీదేవి విగ్రహం పెట్టి నానబెట్టిన బియ్యం, బెల్లం నైవేద్యంగా పెట్టి కుంకుమతో అర్చించి, మల్లి, సంపంగి పూలతో అర్చించి లేదా మీ దగ్గర ఉన్న పూలతో అమ్మవారిని అర్చించి కనకధరస్తోత్రంను జపించి యధా శక్తి పూజించి హారతి ఇవ్వాలి. అనంతరం అందులో కొంచెం తేనే కలిపి పిల్లలకి ప్రసాదంగా పెట్టాలి. ఇలా చేయడం వలన మహాలక్ష్మి అనుగ్రహం కలుగుతుంది. ఇదే ఈ నాటి యోగo – క్షేమo. The post Two Indian Airports Receive Prestigious Global Ranking appeared first on 2 x 4 Stories. The post Indian Yoga Teacher Creates a New Guinness World Record appeared first on 2 x 4 Stories. 7. సహస్రారం - సత్యలోకం - పరమాత్మ స్థానం - కపాలం పై భాగం (మాడు - బ్రహ్మరంధ్రం - సుషమ్న నాడి పై కొనమీద) - అధిపతి పరమేశ్వరుడు - వేయిరేకుల పద్మాకృతి - బీజాక్షరాలు విసర్గలు - ఫలం ముక్తి. 6. ఆజ్ఞాచక్రం - తపోలోకం - జీవాత్మ స్థానం - రెండు కనుబొమ్మల మధ్య (భ్రుకుటి) - అధిపతి ఈశ్వరుడు - తెలుపు రంగు - రెండు దళాలు గల పద్మాకారం - బీజాక్షరాలు హం, క్షం. 5. విశుద్ధ చక్రం - జనలోకం - ఆకాశభూత స్థానం - కంఠము యొక్క ముడి - అధిపతి జీవుడు - నలుపు రంగు - బీజాక్షరాలు అం, ఆం, ఇం, ఈం, ఉం, ఊం, ఋం, రూం, ఏం, ఐం, ఓం, ఔం, అం, అః - తత్వం ఆకాశం, వాహనం ఏనుగు. 4. అనాహత చక్రం - మహర్లోకం - వాయుభూత స్థానం - హృదయం వెనుక వెన్నెముకలో - అధిదేవత రుద్రుడు - నీలం రంగు - పన్నెండు రేకుల తామర పువ్వు - అక్షరాలు కం, ఖం, గం, ఘం, జ్ఞం, చం, ఛం, జం, ఝం, ణం, టం, ఠం, - తత్వం వాయువు - వాహనం లేడి. 3. మణిపూరక చక్రం - సువర్లోకం - అగ్నిభూత స్థానం - బొడ్డునకు మూలంలో వెన్నెముక - అధిపతి విష్ణువు - పదిరేకుల పద్మాకారం - బంగారపు వర్ణము - బీజాక్షరాలు డం, ఢం, ణం, తం, థం, దం, ధం, నం, పం - వాహనం కప్ప. 2. స్వాధిష్ఠాన చక్రం - భువర్లోకం - జలభూత స్థానం - జనేంద్రియం వెనుక భాగాన వెన్నెముకలో - అధినేత బ్రహ్మతత్వం - సింధూరవర్ణం - ఆరురేకుల పద్మాకారం - బీజాక్షరాలు బం, భం, మం, యం, రం, లం - వాహనం మకరం. 1.మూలాధార చక్రం - భూలోకం - పృథ్వీభూత స్థానం - మల రంధ్రానికి సుమారు రెండంగుళాల పైన - రంగు ఎరుపు (రక్త వర్ణం). అధిపతి గణపతి - వాహనం ఏనుగు - బీజాక్షరాలు వం, శం, షం. "Those outside Muslim groups need to reject the terrorist narrative that the West and Islam are in clash or modern life and Islam are in conflict," he added. "I also believe that Muslim groups have responsibility too. ISIL and al-Qaeda do draw selectively from the Islamic texts," he said. "Everyone needs to speak up very clearly that regardless of what the grievance, brutality against innocents doesn't safeguard Islam or Muslims, it harms Islam and Muslims," he said. Note: Don't panic if you have one or more of these symptoms, as they can be related to other issues. However, to stay on the safe side, if you think there is even a small chance you are showing early signs, please get tested, if only for your own peace of mind. If you do have it and you catch it early, the prognosis (a prediction about how something as an illness will develop) will be much better for you. Obviously many patients develop depression after learning they have Parkinson's, but there is a physical link between the deterioration that comes with Parkinson's and depression. Some patients get depressed years before the other symptoms of the disease appear. Lower-than-normal secretions of serotonin and dopamine, the neurotransmitters invovled with many bodily functions as well as mood, can cause this effect. Shaking is perfectly normal under certain circumstances. We may be excited or anxious, have just finished a workout or are feeling restless. But small shakes in our fingers, our hands, our chin, lip of full limbs while we're at rest could be a strong sign of Parkinson's, according to the National Parkinson Foundation. This symptom appears in about 70% of patients and can become more noticeable during stress or excitement. This symptom usually arrives AFTER the other symptoms on this list though. However, many a time it is the first one truly noticed, as the others can all have other explanations. The one who has the confidence to process problems or challenging situations is the one who faces them with courage. He never tries to escape the challenge. Nor does he try to suppress the thought about the problem. He instead uses all the available resources for constant growth. When you understand why the challenge has come you may be able to remain content and will be free from waste thoughts or questions about others. See a solution in each and every problem. So the problem doesn't remain a problem and don't suppress thoughts that might emerge at a later time. First of all, congrats on the phone interview! These calls tend to make people nervous, but since the goal of most phone interviews is to get an in-person interview, just focus on what you would focus on normally in a face-to-face interview, with a few tweaks to allow for the phone element. Clarify the details: Since you may not be in the same time zone as the interviewer (a common reason for phone interviews), be sure to clarify the time of the interview in both your time zone and the other, and confirm who is calling whom (i.e. "I'll expect your call at 11 AM PT / 2 PM ET. My number is… "). Use notes to your advantage: The best part about a phone interview is that you can have your notes in front of you (and the interviewer can't see them). So have a copy of your resume, extensive bullet points about the experiences or skills you want to mention, and full list of questions written out ahead of time for use during the interview. You have the gift of invisibility-use it to your advantage! Dress the part: This is more of a mental tactic than anything else—but dress up a little bit. Looking nice puts you in the right mindset to be professional. Make sure all systems are go: Make sure you are in a quiet place with a charged phone and a glass of water. Call your mom or a friend beforehand from the room where you plan to have the interview, making sure they can hear you with no distractions. (Note: It might be worth it to run home to take the call from your apartment, rather than trying to find a spot to do it from your office.) Also, keep your phone charger handy, just in case the interview is going so well that your charge starts to run down. Keep the end game in mind: Before phone and in-person interviews, I like to use this trick: Think of three characteristics you would like to portray during the interview (creative, analytical, polished, intelligent, interested, whatever!). Write those three attributes at the top of your notes, and as you glance down at them during the interview, you'll have a great reminder of how you want to present yourself. Don't answer questions right away: Since you can't see the body language of the interviewer, wait a half-second before starting to answer any question. Sometimes, people ask questions and then keep talking, and if both you and the interviewer begin speaking at the same time, it can be awkward to figure out who should keep going. Slow down: Speak slowly at all times, even a tad slower than you speak in real life. Phones can intensify the pace of your words. Use your hands: It's okay to gesture while talking, even if no one can see you. Gesturing will make the call feel more like a regular conversation, which will normalize the situation and help to calm your nerves. The Gita advises everyone to adopt 'inoffensive speech, which is truthful, pleasant and beneficial.' During the practice of the Sadhana of truth, at times, it may become necessary to reveal an unpleasant truth. At those moments, you must soften and sweeten its impact by consciously charging it with love, sympathy, and understanding. Help ever hurt never - that is the maxim. Revere truth as your very breath. Your promises are sacred bonds. Never break the vow of truth. The only obstruction to practicing truth anyone will face, is selfishness. Give up selfishness, adhere to truth and selfless love, let your heart be attuned to truth and the mind saturated with love. The triple purity - speech free from the pollution of falsehood, mind free from the taint of passionate desire or hatred, and the body free from the poison of violence - must be taken up by everyone as ideals and lived in accordance with. Take positive thinking to the next level - Post published by Barton Goldsmith Ph.D. on Jan 20, 2015 in Emotional Fitness Positive Self-Talk is a great tool for personal growth as well as for overcoming mood disorders. It can take the form of affirmations, internal dialogue, or prayer. You can choose the method that works best for you.The real trick is to learn to do it on a daily basis. The use of affirmations became very popular in the 1980s with the help of You Can Heal Your Life, by author and publisher Louise L. Hay (whom I had the pleasure of meeting some years ago). Affirmations are short statements about how you want to improve or are improving yourself. A well-used one is "Every day, in every way, I am getting better and better!" This one has been around forever, but there are millions more like "I enjoy perfect health" or "I am overcoming my fears." You can make up your own. Repeating these statements many times throughout the day will change the way you think and feel. Yes, it works and, no, you cannot just say affirmations and expect your life to get better, unless you take the actions that are necessary to accomplish your goals. Another method of Positive Self-Talk is to have a conversation with yourself about your behavior. For example, if you've been avoiding things as a means of self-protection, you can tell yourself that you no longer need to protect yourself the way you've been doing and that you are safe in the world that you have created. You can remind yourself that you are now in control of your life. You are not a victim, and you have the strength to deal with any situation, even if it causes you some anxiety. This kind of internal dialogue can serve to make you stronger, help you be more of the person you want to be, and give you greater confidence. The more you do it, the better you will feel. I'm not suggesting that every thought be focused on your own personal growth, but rather that you take some time, every day, to give yourself a good talking to. The effects are pretty quick and last as long as you continue the process. Another positive internal dialogue is simply telling yourself that you are and have been more than okay over the long term and that whatever is vexing you at the moment will pass. Many times we get upset at temporary situations and don't look at how we have prevailed in the past. When you recall what you have had to overcome, it will give you the power to believe in yourself again and get over your current hurtle. Using Positive Self-Talk on a daily basis is something I could never do without. Regardless of what method you use, focusing on the positive is better than focusing on all the negative stuff that has happened to you or may be going on in the world. "I don't know how this happened, but we have 103 passengers aboard and only 40 dinners." "Anyone who is kind enough to give up his meal so someone else can eat will receive free soft drinks for the length of the flight." 1- Why you (and only you) are being asked/pushed to compromise? 2- What are the short term and long term personal consequences if you compromise? 3- Who is getting benefit out of it? Consider direct and indirect people involved. 4- What are the risks/impacts on the project/task if you compromise? A legal case? Conclusion: Ethical Values (such as Truth, Honesty, Fairness, Transparency and self discipline) are unique treasure which you possess. Don't lose it at any cost. Your values are defining your character which is leading you towards your destiny. Sine you don't want to be a failure at the end of the day, so you need to stick to the humanitarian principles because the ultimate fact remains the same; 'As you sow, so shall you reap'. A Study confirms that the people who possess high ethical values are more happy than those who are engaged in fraudulent acts even if former earn less than the deceitful people. At an occasion on Monday, veteran legal advisor and politician Ram Jethmalani lock-lips with yesteryears actress Leena Chandavarkar. Kishore Kumar's wife Leena Chandvarkar and Jethmalani met and welcomed one another at The Hum Log Awards on February 16 which is the point at when the two kissed. They spend considerable time on the dais, had a talk and shared a kiss. This is not the first time that Ram Jethmalani kissed somebody openly. Earlier in 2014, a photo of him kissing famous actor Dharmendra on his birthday became a web sensation.